We are committed to optimise efficiencies in our operations and minimise our environmental footprint. Keppel Seghers, a subsidiary of Keppel Infrastructure, completed a substantial part of the Doha North Sewage Treatment Works project in Qatar and handed over the wastewater and sludge treatment facilities in the project to Ashghal, the Public Works Authority. The facility, spanning 4km by 4km, is able to treat up to an average flow of 245,000m3 of wastewater a day using advanced membrane and ultra‑violet treatment technologies. The high‑grade reclaimed water is used for non‑potable purposes, thus freeing up Doha’s precious drinking water supply. As part of the project, Keppel is also developing a green buffer zone – a sanctuary for migratory birds amid vast desert sands, which is set for completion in 2017. The reclaimed water is used to irrigate the green buffer zone, while the processed sludge is used as organic fertiliser or in landscaping projects. Keppel is proud to contribute to sustainable urbanisation in Qatar. Keppel Data Centres Holding, a subsidiary of Keppel Telecommunications & Transportation (Keppel T&T), participated in a trial with the Infocommunications Media Development Authority of Singapore to develop and deploy the world’s first Tropical Data Centre. Currently, a significant portion of energy consumption in data centres goes towards keeping temperatures and humidity at low levels. By being able to function optimally at higher temperatures and humidity levels, Tropical Data Centres are expected to reduce energy consumption by up to 40%. 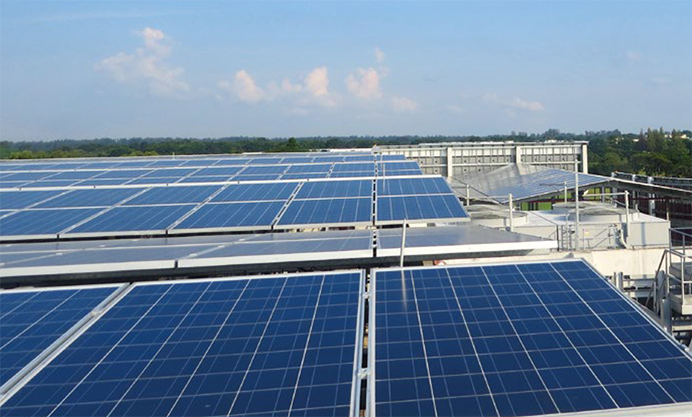 In 2016, Keppel Land’s corporate office at Bugis Junction Towers became the first Green Mark‑certified office to be fully powered by solar energy. The solar energy is purchased from Keppel Electric. With this new initiative, Keppel Land is expected to offset about 150 tonnes of carbon emissions every year. Alpha Investment Partners retrofitted Ibis Novena Hotel Singapore, which is owned by one of its funds, by replacing the existing split unit air‑cooled airconditioning system to a more efficient water‑cooled central air‑conditioning system. This upgrade is expected to yield significant energy savings and reduce greenhouse gas emissions. To improve energy efficiency at Keppel FELS’ yards, electric cables have been rerouted to transmit electricity via a power grid instead of the less‑efficient diesel generator. Across the Group, Keppel’s businesses use NEWater (treated wastewater from sewage) where possible, to reduce the usage of water from local catchment and imported water. Other water saving initiatives include installing water‑efficient equipment and devices, encouraging good water usage habits as well as improving leakage inspection and response times. At Keppel FELS, scrap materials from the yard are reused to build passages that channel rainwater from rooftop gutters and drains to a tank for gas hose testing. Keppel aims to achieve a 16% improvement in its carbon emissions from 2020 business‑as‑usual levels. Keppel Land’s premier waterfront development, Corals at Keppel Bay, is home to a thriving kaleidoscope of coral reefs and marine life due to the company’s efforts to conserve biodiversity. Corals at the historic King’s Dock at Keppel Bay are being transplanted to enhance the existing habitat for marine life. This initiative is a first by a private developer. Keppel Land’s corporate office at Bugis Junction Towers is fully powered by solar energy from Keppel Electric.